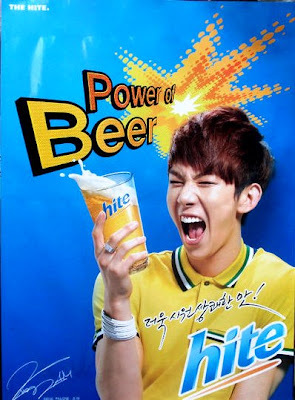 A standard hite ad located in the Korean subway. "Teacher my religion is alcohol!" Yes, a mature male adult from my school blurted this statement out in perfect English while in class one day! Of course I am so used to the culture here now, that a statement like this would not boggle my mind. Neither would witnessing 2 drunk girls fall asleep on a sidewalk at 3 am and watching no one do anything to help them. Nor would watching men stumbling and hiccuping on the sidewalk at 10am in the morning. So what is the Korean drinking culture like, and why is it so different from Western culture? In short, drinking in Korea is not a shameful act. And you can pretty much picture all of Korea like a giant Las Vegas; you can even drink on the streets. In fact there is no such thing as alcoholism here. Many of my students and Korean friends have never heard of such a thing. After explaining the definition of alcoholism to my friends, some of them replied "This must be a made up story." I agree that alcoholism is a proven psychological and sometimes physical addiction to a substance. But I can also understand why Koreans don't believe this is a true disease. Why you may ask? Because drinking is such a useful skill in Korea. Korean drinking games are a staple when hanging out with good friends. 1. getting a job/making a business deal- Going out to get pissed drunk with a potential boss or business client will definitely help your chances at getting hired or making a deal in Korea. In fact, you should never reject another drink from your boss. Many of the older generations in Korea see drinking with colleagues or partners as a time to bond and form true relationships. If you end up puking on the sidewalk and passing out, this will be no problem the next morning at work. You will probably just get a funny nick name and a raise! 2. apologizing- One day in class my students were talking about how they prefer to go out drinking when they have to make an apology. They apologize and move on immediately to make new memories. Apparently the middle aged generation of 25-30 years old is having trouble using this technique with younger generations. The younger generations roughly from ages 18-25 prefer having a public apology with many of their friends act as a witness to the persons testimony of faith. (외국인) means foreigner in Korean, and almost all Koreans use bad English and say "I am very drunken" when they start speaking to foreigners late at night. Yes, I understand that these skills are not universally accepted in Korea. Many companies are starting to crack down on peer pressure related to drinking. And many more are starting to enact strict policies in favor of Koreans who do not accept drinking as a part of their lifestyle. But I see this change happening very slowly in Korea, and having very little affect on most of the population's drinking. I even teach two entire classes of Tell a Story at my school, which use vocabulary and stories strictly pertaining to drinking. Yes, I teach my students words such as hangover, wasted, and buzzed and it is a requirement! Check back soon for another article about this class. Till then, happy soju time!